After a bit of post holiday slumping around, I decided it was about time to change me from the outside in. Time for a Mojo Uprising!!! 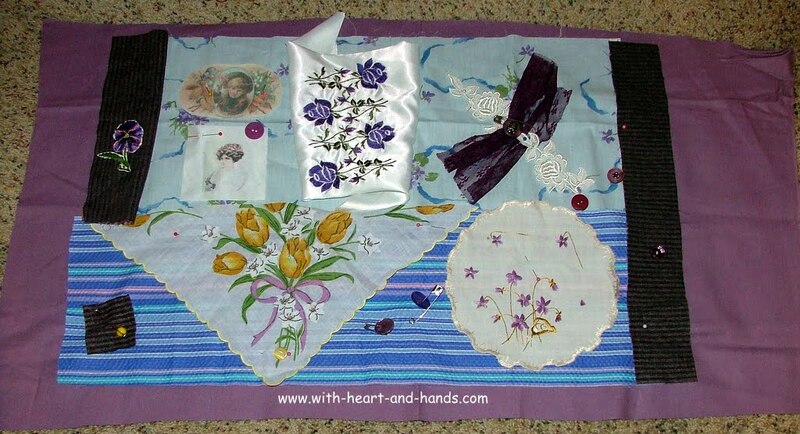 Time to sit a spell, work my magic, get out the textile talismans and guess what? I It worked like a charm! Winter blues begone..out, out, I say!!!! Indigo Blue Talisman I.D.bag and Supplies for the Magic to Begin!!! 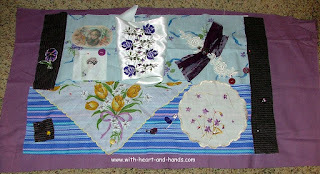 Out came the Alzheimer's Fidget Quilts bags and bits, scraps and strings, beads, buttons, and baubles. 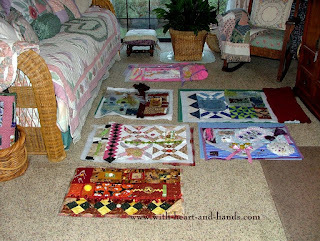 How can anyone feel anything but wanting to play when you fill your nooks and crannies.....inside and out.... with creative fun? Fidget Quilt and Mojo Uprising, indeed! 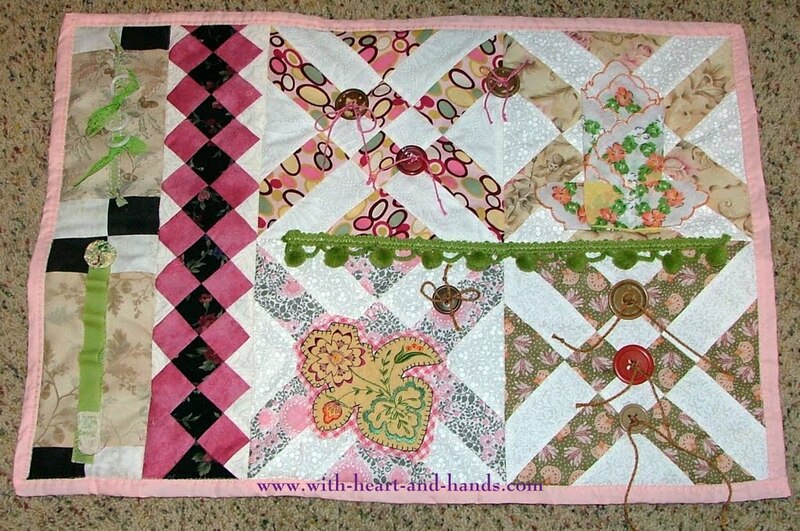 Three fidget quilts for Alzheimer's and related Dementias in progress. 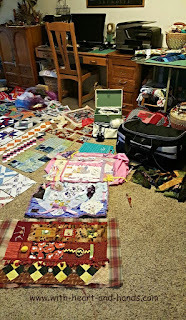 The plan is to have enough of a head start be able to work in a Fidget Quilt work session with others without having to sit there and mentally search through the archives to think of what to do next. Oh, wait. I will anyway because...let's face it...I'm still major and chronically sleep deprived with 13 ancestral and immediate relativity DNA strands reminding me to keep my heart and hands busy for my own healing and hopefully...keep the dementia limited to wild and crazy fun!!! And yes, I am half French and if anyone has the right to use this word...besides the dictionary... in any context she so chooses... it's someone who spend three years as a live in 'round the clock helping her loved ones battle Alzheimer's and dementia ..hallucinations and all. Oh wait, were those mine or theirs? I said that to make the beloved voices in my head laugh and trust me, they are. My mother and I found that the best way to keep the dementia demons away....besides magic charms and talismans...and of course never giving up hope and prayers....was to mock it and take our power right back from it on a daily basis. We laughed until the tears ran down our cheeks every single time her Audubon clock chimed 'cuckoo cuckoo' when it hit that bird at whatever o'clock. She'd chime in, my dad would look over from his recliner like we were both crazy..and then, we laughed all the harder!! Have you heard? The number of pets on anti-depressants and anti-anxiety drugs is rising? I mean, really..do we want to pass that on to our little beloveds? I think not! 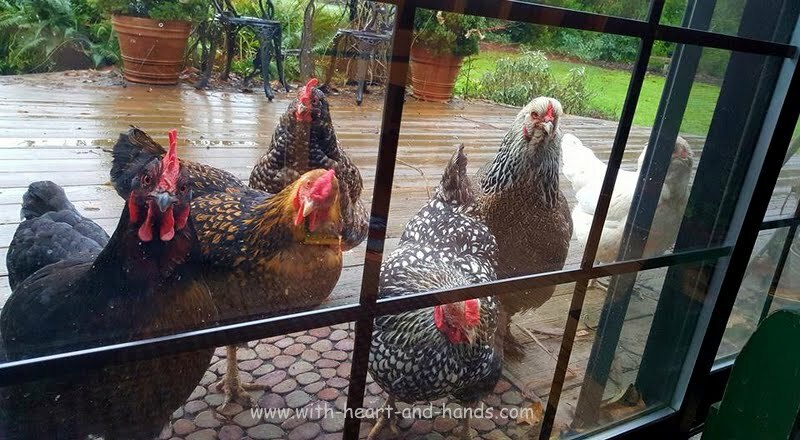 I'm teaching my chickens to love life and have fun! Turn it around into goodness and light, that's my motto. Don't let the What If's Control You! Missing is fine, remembrances are lovely, but to take the hard times and do good...well, that's the very best magical mojo of all! Out, out Alzheimer's dementia, sleep deprived memory loss, and in with the creative aspects of our other selves that allows us to cross that very thin veil into pure creativity and fun! 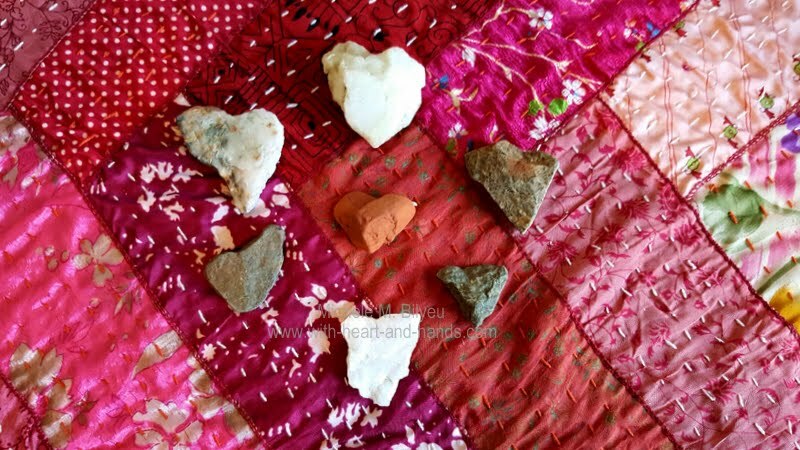 Michele Bilyeu Creates With Heart and Hands as she shares her creative and healing journey from Alaska to Oregon. 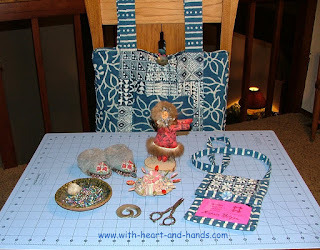 ..Creating, Designing, Sewing, Quilting, and Wildcrafting. Join me as I add my healing energies to changing our world..one little project, one gift of sharing from my heart at a time. You're working on three, very different, but all wonderful projects at the same time. Michele, I've got those mid-winter blues myself, but thanks to your encouraging post, I'm going to follow your example and cast them aside. For the remainder of my weekend, I'm immersing myself in the magic elixir of creative play. First project: a needle-felted woodland gnome! thanks for the inspiration. Yikes, your energy level is in full swing! 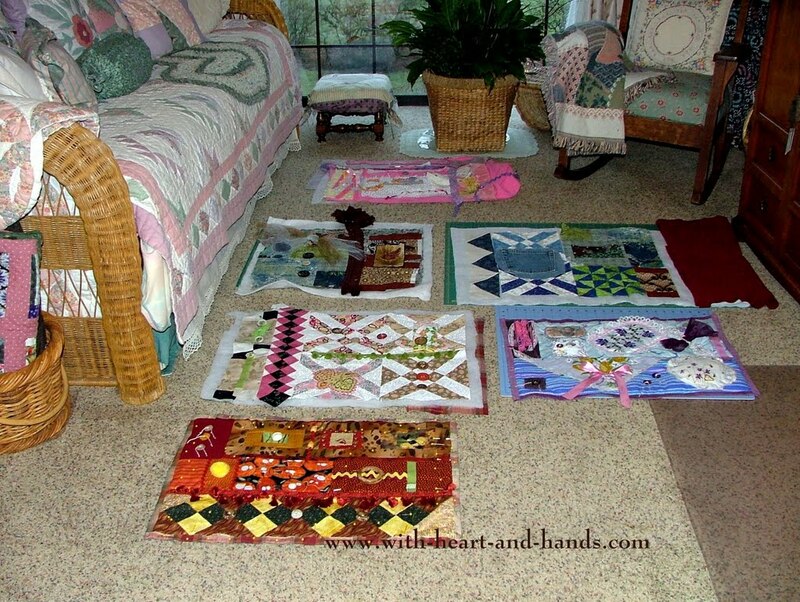 I love all these projects and have a special fondness for your Fidget Quilts. You are a beautiful spirit. Thanks, Shasta! I appreciate that. 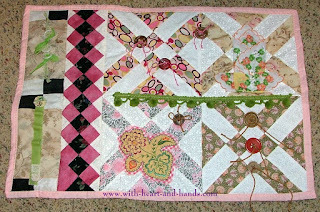 Love the most recent quilt of yours. Check it out, readers! It's that time of year, Joanna! We all want to go into our caves and hibernate. But that doesn't mean we can't sew and adding in design boosts the creative element which is the good side of the 'dark' side!!! Love your gnome idea. Will be fabulous fun! Penny, you are one of the dearest readers ever! We connected through our love of rabbits and the connection continues! Don't have to comment each time. Feel free to just read. Most of my constants disappeared and I wouldn't want that to happen to you dear friend! I don't have a blog. I haven't a clue as how to create one, but I sent you a looooong email to you from bjpruettbunnyblue@gmail.com.